LOS ANGELES (CN) – Heracles lies at the center of federal forfeiture proceedings in Southern California, after an 18-foot, one-ton ancient mosaic depicting the mythological hero smuggled from war-torn Syria was recovered from a home by federal agents. The mosaic likely dates to the third or fourth century and was found at the Palmdale home of Mohamad Yassin Alcharihi. The U.S. Attorney’s Office says Alcharihi has been the center of an FBI investigation since 2015. Agents have been looking into Alcharihi’s suspected involvement with “smuggling looted items believed to be from a foreign conflict area into the United States,” according to a forfeiture complaint filed this week in the Central District of California. Prosecutors say Alcharihi hired a California customs broker in August 2015 to process paperwork to import items into the United States. Soon after, three mosaics and 81 vases arrived at the Port of Long Beach near Los Angeles. According to documents submitted to U.S. Customs and Border Protection, Alcharihi said the items were valued at approximately $2,200. He later told federal agents he paid $12,000 for the mosaics and vases, prosecutors say, adding the value of the ancient mosaic is likely much higher. Agents said they interviewed two witnesses who did some restoration work on the mosaic for Alcharihi at his home in March 2016. One of the witnesses says Alcharihi paid him $40,000. “Alcharihi further told Witness 1 that the mosaic was peeled off a floor 25 years ago and that it had taken him (Alcharihi) 10 years to get the mosaic out of Turkey because the laws had changed there. Alcharihi told Witness 1 the mosaic had been rolled up for 25 years,” prosecutors say in the complaint. However, an expert on ancient mosaic floors told federal agents the mosaic was an authentic piece from the Byzantine Period depicting Greek mythology and the iconography was consistent with other art found near the Syrian city of Idlib. After agents served a search warrant at Alcharihi’s home, Alcharihi said the mosaic came from Turkey. His email trail, however, indicated the piece came from Idlib, prosecutors say. 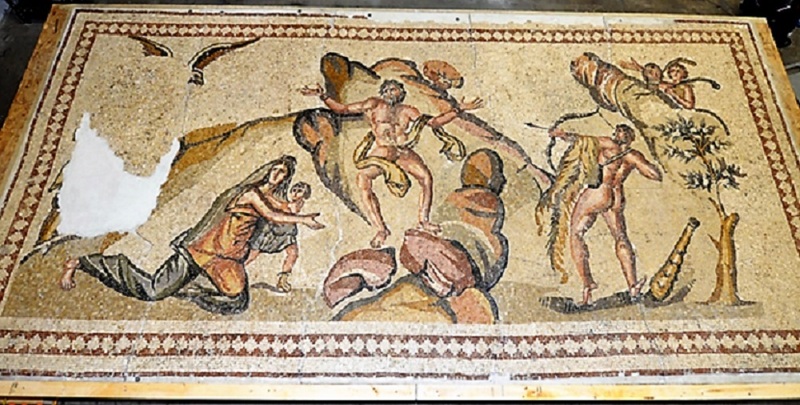 In another email Alcharihi says the mosaic depicts Heracles, Aphrodite and Zeus, according to the complaint. Prosecutors say Alcharihi is a Syrian national and became a U.S. citizen in 2010.